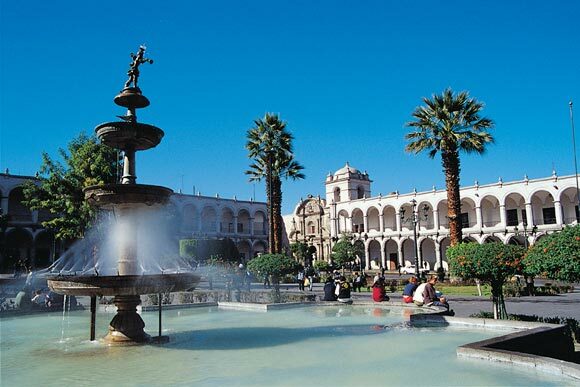 Arequipa is the second most important city of Peru, located at 1009 km South of Lima. With a population of 1'000,000 inhabitants. August 15 th , 1540, this city was plannified and built in a form of a damero. In the year 2000 the old part of the city was declared as Mankind's Historical Monument and it is also known as the ‘Ciudad Blanca' (White City), due to its constructions made of ashlar. The city's main industry is mining, the gold, silver, copper, zink, etc. are exploted, factories of steel, fish flour, a great production of olive oil, wines and piscos, chocolates, factories producers of alpaca, vicuña and guanaco fibers, brewery, agua ardiente of anisette, etc, agriculture, the production of onions, garlics, potatoes and lived corn and cattle raising. Arequipa has 4 universities, one of them is national. 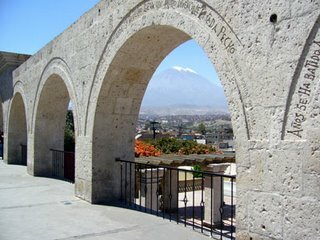 Arequipa is also a tourist city. The starting point for the Colca Valley. Arequipa has 29 districts and the department 7 providences. In the department influences such as Tiwanako , Wari, Nazca, Lupaka, Colla, Inka, among others were had. 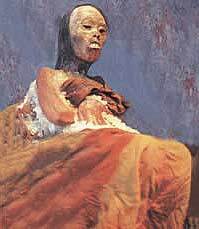 During the colony, Arequipa was known for its illustration, the high academic level achieved by its inhabitants, the majority of them were mestizos and white people. The varied geology makes of Arequipa a paradise for geologists, and due to the clear accent and slow of Spanish a delight for the students of this language. Arequipa is the world capital of the alpaca wool and it is main place of the mining congress. The weather : Arequipa is temperate during the day with decreasing temperature at night. 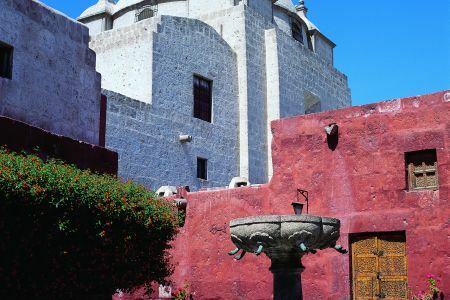 The sun shines in Arequipa 300 days a year, with a rainy climate during January to March, and temperatures of 25 C during the day and 11 C at night. In winter the temperature is 21 C during the day and at night it can arrive at 4C. From September to December, 25 C during the day and at night more than 11 C. From January to March there are moderate rains. The city has a lot of attractions like colonial hybrid architecture shown in churches, convents and manors. Also in the city surroundings you can appreciate the beautiful traditional settlements with its churches and natural landscapes. It is not far from the tourist destinies: the Valley of Colca, Valley of Cotahuasi, Titicaca Lake, Cusco, Machu Picchu, Port Maldonado, Camana and Mollendo beach, and the volcanic mountain range of the andes. Here in Arequipa you can try delicious traditional food. The hybrid nature of which, reveals itself in several ways. The local "picanterias" (spicy food restaurants) are there for the delight of the passer-by. "...pues tu divino ingenio ba producido en Arequipa eterna primavera..."